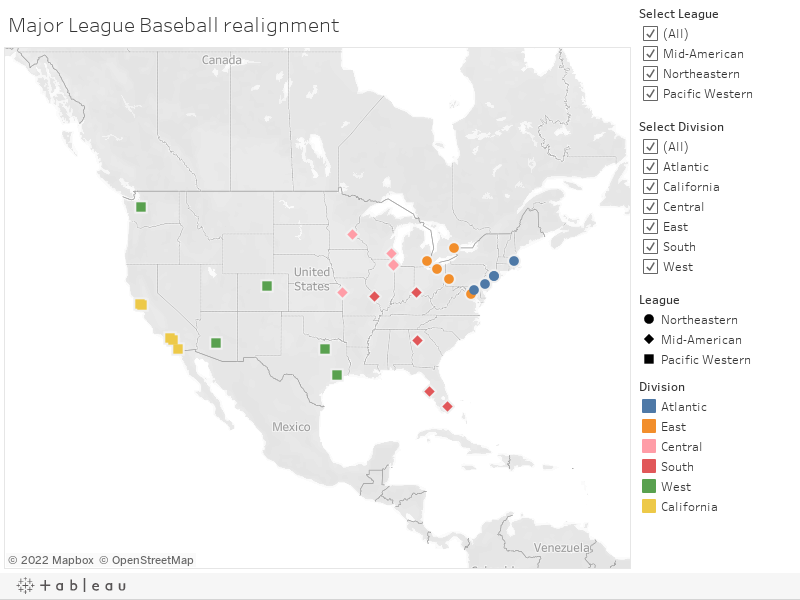 Baseball currently has two leagues, three divisions of five teams in each league. In response to Dan Shaughnessy's column in the Boston Globe, here's my suggestions for improving the game. I love the demonstration of strategy, so I would happily get rid of the Designated Hitter and expand the roster to 27 players. Not mentioned in the article, there's nothing like a west coast road trip and a string of 10:05 p.m. starts to drain enthusiasm for the game. Realigning the league, so the majority of games are played in geographically aligned divisions and leagues, means more fans can make easy road trips to away games, and fewer east coast fans will be forced to choose between sleep and a game with a 10:05 p.m. start. When you look at the map, it all makes sense! On a 162 game season, the teams play the other nine teams in their league 12 times each, total of 108 games. The remaining 54 games need to be divided among the remaining 20 teams, so that you would play a three game series with 13 teams and a two game series with the remaining 7 teams, yielding a 162 game schedule. For inter-league games, the series would alternate each year between the two teams. For example, Red Sox go to Seattle in odd number years, Seattle goes to Boston Red Sox in even years. You could stack it so the Red Sox visiting LA would play the Angels and Dodgers in the same road trip. You would reverse seed the teams, based on the previous year's standings, to determine which team gets three games and which gets two. For example, Cleveland had the best record in what I described as League 1 (Atlantic and Eastern), so based on the 2017 record they would play two games with the 7 teams with the worst non-league record (MIA, OAK, ATL, SD, CIN, CWS, SF) and three games with the rest of the teams. Conversely, Detroit (worst record in League 1) would play only two games with the top 7 teams outside their league (LAD, HOU, ARI, CHC, COL, MIL, MIN) and three games with the remaining teams. An east coast team would play in the Pacific Time Zone no more than nine games in a given year. An Atlantic Division team would play 81 games at home and the and 54 road games would be played in the confines of a geographic region bounded by Toronto, Detroit, Washington, and Boston. A previous discussion with Ron Newman questioned putting the Cubs and Cardinals in separate divisions. I swapped the Cardinals and Royals, but chaned my mind and swapped them back. Why? Under the scheduling scheme, teams in the same league would play each other 12 times, regardless of the division. If they are in separate divisions, they could end up playing each other for the league championship, which enhances the rivalry. Remember, the Cardinals have a loyal and devoted fan base throughout the south, thanks to their powerful radio signal. You could have four wild cards, with two play-in games. Have the division champs play each other for the league championship, have the wild card teams play each other for the wild card championship, then seed the four remaining teams for two rounds ending in the World Series. Also check out my 2019 Progress Monitoring, 2018 Progress Monitoring, 2017 Progress Monitoring, and 2016 Progress Monitoring Charts.